KAMLOOPS - Tyler Brown recorded a 37 save shutout to lead the Pats to a 3-0 win in Kamloops over the Blazers on Friday night. After a scoreless first, the Pats took the lead when Austin Wagner beat a screened Connor Ingram late in the second for his 11th of the year and it was 1-0. It stayed that way until late when the Blazers pulled Ingram for the extra attacker. The Pats scored twice into the empty cage and improved to 17-2-3-0 with a 3-0 win. The penalty kill was eight for eight with a shorthanded goal. Adam Brooks paced the offence with a goal and two helpers and extended his point streak to 16 games. The Blazers outshot the Pats 37-35 in the contest. - The Pats scored their league leading 14 shorthanded goal of the year in the win. - Tyler Brown recorded his 5th career shutout on Friday (including playoffs). - Austin Wagner has goals in three straight games. 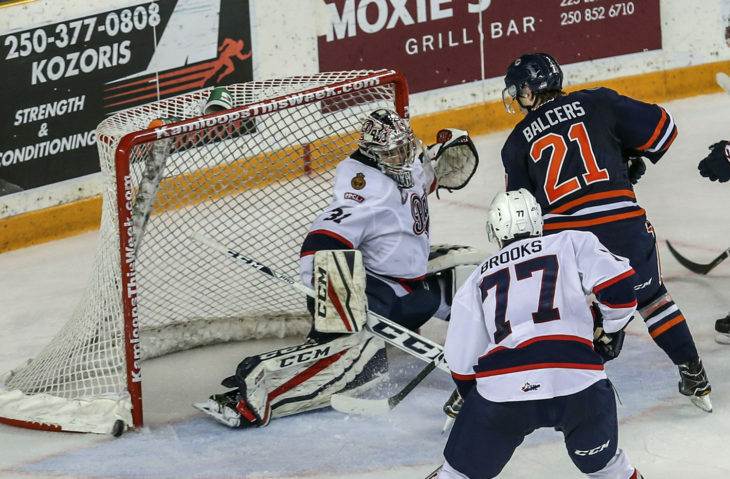 The Pats will wrap up their six game road trip in Kelowna on Saturday against the Rockets at Prospera Place. Puck drop is at 9 p.m. Regina time on 620 CKRM. Happy to see Brown get the shutout. Finish strong tonight Pats! Tyler Brown was a stud. Best player on the ice by far. A good win after the minor setback the other night. Brown was very good early in the game to keep Blazers off the board as Pats gave up a number of turnovers. They missed Steel, as Jake just doesn't have the touch yet but he will, ...look forward to the next couple of years when Brooks is in the NHL, and Jake can take over #2 center spot. Meanwhile Adam just keeps on ticking with another 3 pt night...what a streak going back to last year!